SP and I don't especially enjoy most chain restaurants, but when you live in an area like Robinson, it's kind of hard to avoid them. Sometimes, you just don't want to spend up to an hour getting through the tunnels and into the city/Squirrel Hill/Shadyside. Sunday evening was one of those times. It was 6:30 pm by the time we were done with the painting & re-organization projects, including lots of clean up, plus the other chores like grocery shopping. We were tired and suddenly not in the mood for grilling (and the grilling/dinner clean up), plus the ground meats had not completely thawed. We remembered that we received a gift card to Darden Restaurants as a wedding gift, so we decided to pick one of their restaurants and treat ourselves to dinner out. Our choices: Red Lobster, Olive Garden, LongHorn, Bahama Breeze, or Capital Grille. We chose Bahama Breeze. To our surprise and relief, there was no wait for a table inside at 7 pm on Sunday. We had planned to sit outside, but when we got out of the car, the angle of the setting sun on the deck and the humidity combined to make it just uncomfortable enough that we changed our minds. Once seated inside the cool, dark interior, SP ordered an Aruba Red beer plus an iced tea and I ordered a glass of Monkey Bay Sauvignon Blanc. He liked his beer. My wine was so-so. 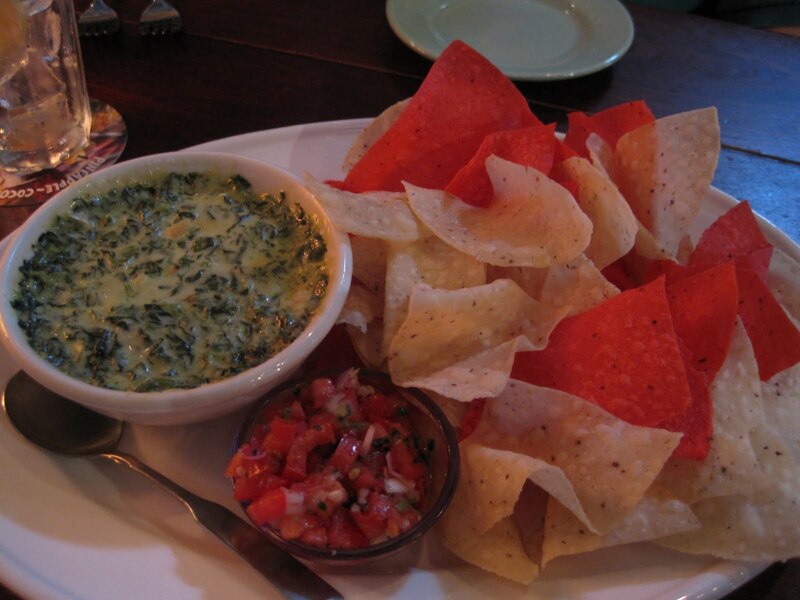 We also started with an appetizer of Warm Spinach Dip & Island Chips - spinach, artichokes and cheese, with a hint of nutmeg. The chips were very thin and salty and tasty, especially with globs of gooey, cheesy spinach dip on top. I didn't try the salsa; SP did and said it was good but it did have a wee bit of garlic in it. 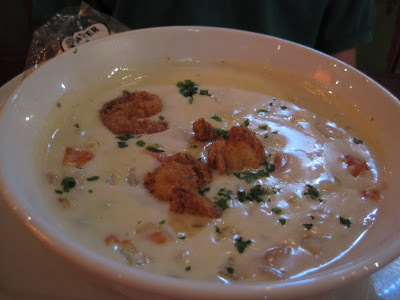 SP really enjoys soups, so he ordered a cup of Bahamian Seafood Chowder - cream base with shellfish and vegetables, topped with fried shrimp. I was surprised he ordered this soup because it is a cream based soup and because the shrimp are breaded and fried. He enjoyed it, though, and based on my small taste it is a tasty soup. Of course, I like most things creamy and fried! 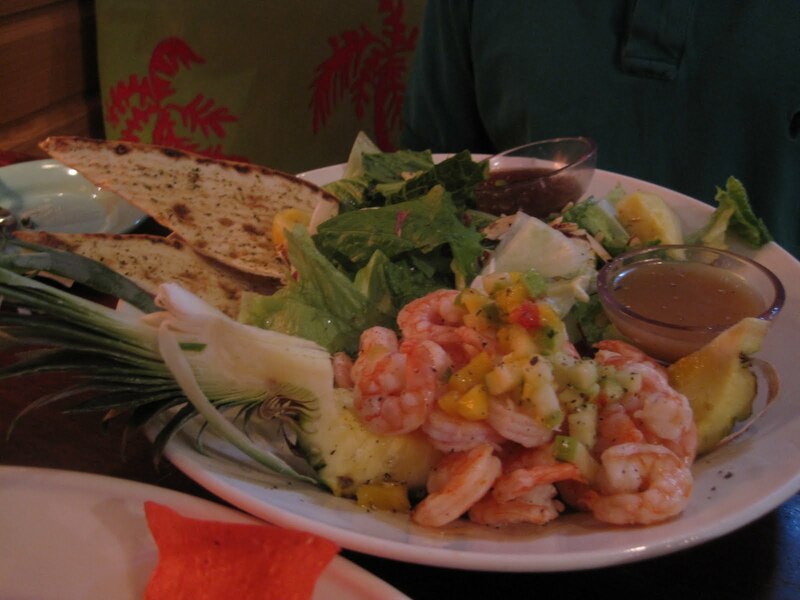 For his meal, SP ordered one of the dishes marked as new: Cuba Libre Shrimp Salad - chilled shrimp tossed with a rum and cola glaze; served with fresh greens, pineapple and candied almonds tossed in sugar cane vinaigrette. He said he really enjoyed the salad and he ate all of it. The shrimp I tasted was a good shrimp although I didn't taste much of the glaze, but it might have settled underneath the shrimp pile. 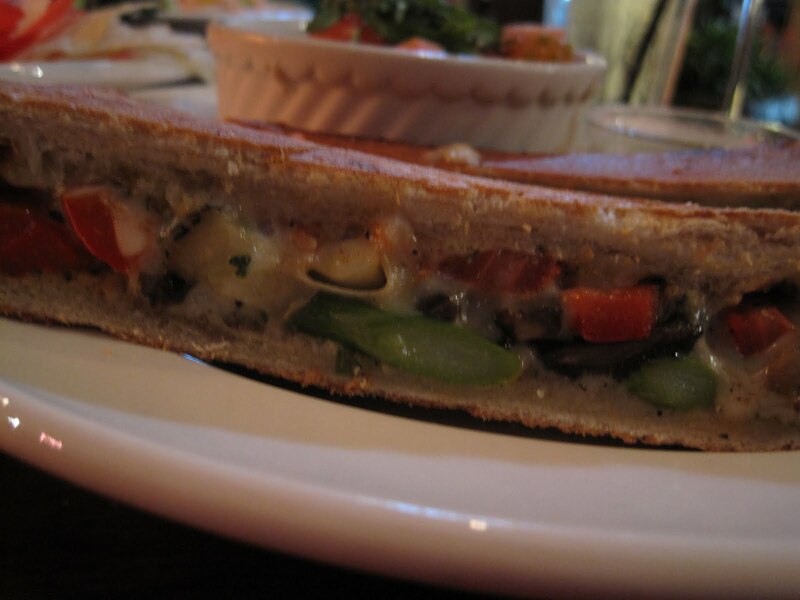 The flatbread was tasty, too. For my dinner, I wanted to try the new Lobster & Shrimp Quesadilla appetizer - steamed lobster and shrimp with spinach and cheese, served with tomato salsa and sour cream - but our server told me they were out of shrimp & lobster - ?? So instead I ordered Sun-Drenched Portobello & Vegetable Sandwich - seasonal vegetables and pepper-jack cheese, hot-pressed on Cuban bread. Sun-drenched portobello means the portobello is marinated in their island vinaigrette (I asked). I thought our server said there was chipotle mayonnaise, which I asked for on the side, but the side was a vinaigrette - ?? 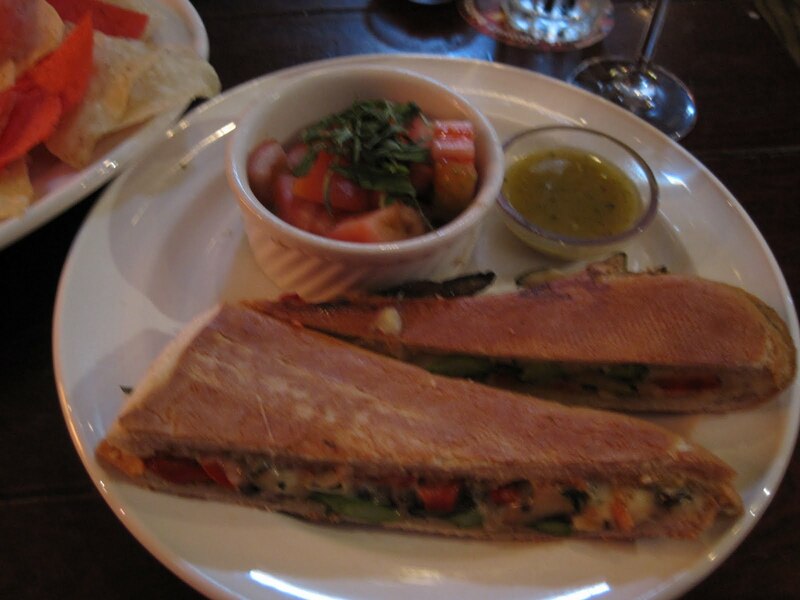 There were lots of vegetables (red peppers, asparagus, onions) but either the pepper-jack cheese was way too peppery for me or there was some other spicy sauce on the sandwich because there was definitely a kick of heat, too much for me, and I won't be ordering this sandwich again. I ate half of the sandwich. SP took the other half to work for lunch on Monday. He told me Monday evening that he, too, thought there was a bit too much of something with a kick/some heat on the sandwich. He liked it, but he also said it was stronger than he would have expected for a sandwich. 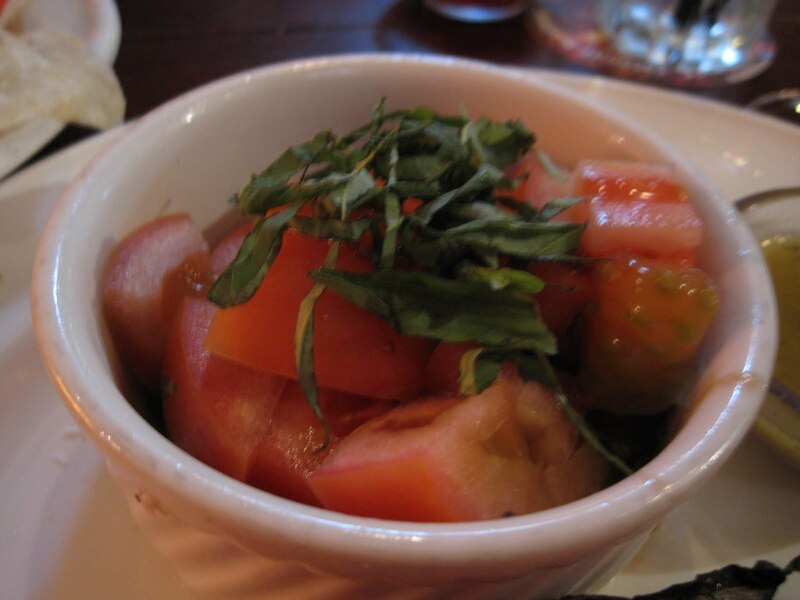 For my sandwich side, I chose Tomato Salad. Chopped tomato sprinkled with fresh basil and drizzled with a balsamic sauce (which was pooled in the bottom of the ramekin). This was tasty, but since we do this frequently at home it wasn't that much of treat for me (sometimes I think that when I eat out, I should order dishes we don't normally make at home). The tomato could have been riper, but then again, the tomatoes we bought last Sunday could have been riper, too. It's just not quite tomato season, I suppose. We didn't order dessert. On the drive to the restaurant, I had seen that Rita's had Key Lime ice so we were sort of planning on stopping there for dessert, but we went to WalMart to get some bleach and then on the way home we didn't go past Rita's and I forgot all about the Key Lime ice until it was too late. Oh well! The dish is listed at $19 and some cents. I know that, for me, chances are a $19 pasta at a chain restaurant will not be nearly as good as a $19 entree at many of the non-chain restaurants at which we dine, and in fact, as an example, none of the pizza/pasta dishes at Piccolo Forno cost $19+ and they were much better than anything I've had at a chain. I know I would end up disappointed in the dish at Bahama Breeze and be sad and maybe a little angry that I spent $19+ on it when I could have had a much, much better meal for $19 or less at another place. But as long as I can find a salad or sandwich or something else in the $10-$15 range and it tastes decent, I'm OK with occasionally dining at a chain. And of course, on this visit, our meal + tax & tip at Bahama Breeze only cost us $3 since we had a gift certificate - not bad! Know what's really funny? I considered stopping there for dinner Sunday on my way back from hiking... and it was around 7. Unfortunately, I didn't because a) I was by myself and I'm not fond of dining at sit-down restaurants by myself and b) I had plenty of food in my freezer that I need to eat. That would've been pretty funny though! I've never been to Bahama Breeze (mostly because it's a chain and we always seem to end up at Moe's when in Robinson), but this sounds promising.